Beds, organizers, Adirondack chairs, a play table, and more! 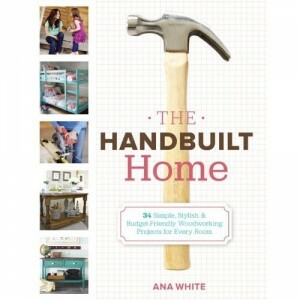 It’s easy to build inexpensive, quality furnishings with The Handbuilt Home, an indispensable collection of woodworking projects from Ana White, the popular blogger who has inspired millions of homemakers with her stylish furniture plans and DIY spirit. As a young mom on a tight budget, Ana learned to make her own well-designed pieces, inspired by the styles in her favorite stores and saving thousands of dollars in the process. Now, in this reference for woodworkers of all skill levels, Ana shares everything she has learned along the way. Inside The Handbuilt Home you’ll find plans for 34 versatile furniture projects for every room in your house from beginner-friendly home accessories to sturdy tables, a media center, kids’ items, and storage solutions and comprehensive information on using off-the-shelf lumber and basic equipment. Almost every project can be made with a drill, a saw, and some hand tools.